You are here: Home / Botrytis Cinerea / The Golden Rules! In 1152, in a pivotal moment of European history, Duchess Eléanor of Aquitaine wedded Henry Plantagenet, Count of Anjou who would later become Henry II, Duke of Normandy and king of England. In a testament to the often convoluted, monarchical alliances of Europe, Henry was at once the sovereign of England and vassal to the French king. At the heart of Eléanor’s western domain lay the strategic port city of Bordeaux, which quickly emerged as a thriving hub for commercial wine trade with England, ushering in the city’s first golden age. When in 1337 English king Edward III refused to pay homage to the French monarch Philip de Valois, declaring himself heir to the French throne, the devastating Hundred Years War ensued. It was not until 1453 at the Battle of Castillon that the French crown recaptured Aquitaine ending over 300 hundred years of English rule of southwest France! Eleanor of Aquitaine, queen consort of Henry II of England. Classified as a UNESCO world heritage site in 2007, Bordeaux today, with its storied châteaux has for centuries dominated the top echelons of the fine wine trade crafting celebrated reds primarily from the noble varieties Cabernet Sauvignon, Cabernet Franc and Merlot. Yet there is another, more discreet jewel in the crown here – the inimitable white dessert wines of Aquitaine! Just south of the city of Bordeaux in the districts of Sauternes and Barsac, consistently remarkable and often stunning wines are assembled from the grape varieties Sémillon, Sauvignon Blanc and Muscadelle. These viscous elixirs are layered with poached apple, peach, quince, nectarine, hints of honey, luscious tropical fruits and candied citrus. Bright, refreshing acidity courtesy of the Sauvignon Blanc variety makes for perfectly balanced wines that can be simply mesmerizing! Most are delicious as an accompaniment to a fruit tart or foie gras but the lighter, more racy styles can shine with savory dishes as well. The best examples explode with aromatic intensity and flavor! As with many other of the world’s regions where these wines (often known in Anglo circles simply as stickies)are produced, what is most fascinating about them is what brings them to life. For the wines of Sauternes and Barsac the common thread is moisture. Thanks to the confluence of the spring-fed, cooler waters of the humble Ciron river with those of the warmer waters of the Garonne, a fungus known as botrytis cinerea often proliferates here, producing some of the most spectacular and longest-lived, white dessert wines in the world! Well into September, when most of the Bordeaux region’s still red and white varieties have been harvested, the vinous bounty of this southernmost district is heavy with late-hanging, intensely ripe fruit. As the two waterways intersect, the condensation that rises from them casts a humid cloak over the vineyards, creating prime conditions for the botrytis cinerea spore to propagate. The unique terroir of this area often creates an ideal climatological context for this phenomenon – humid mornings are followed by warm, sunny afternoons allowing the grapes to dry thus permitting the fungus to remain in check and develop in a healthy, methodical way. Ironically, this same parasite under different circumstances (e.g., cloudy conditions of unchecked humidity) is known as grey rot, one of the most destructive diseases of the vine. As the population progresses, spores bore into the berries extracting significant quantities of water. The diminishing water content causes the berries to raisin, or shrivel in a process known as desiccation. This concentrates the fruit’s sugars, enhancing glycerol (viscosity) and promoting intense, complex flavors as the sugar to water ratio in the berries increases in this highly unique environment. Multiple passes in the vineyard are required to assess the state of individual berries. When sufficiently botrytized, grapes are harvested by hand (often berry by berry) as mandated by law. The botrytis process effectively offers the winemaker a dense and syrupy juice that will ferment to a certain point and then cease to do so. In an environment of elevated sugar yeast will convert only a portion of these to alcohol then slowly die off leaving significant amounts of unfermented, or residual sugars. Fermentation increasingly takes place in French barriques of which 1/3 are commonly new. Typical alcohol levels are around 13+%. While other wine lands, (notably Italy and Germany) have produced similar style dessert wines for centuries using various techniques for concentrating musts, only this region of southwest France is dedicated exclusively to white dessert wines of this type. Neighboring districts of note include Cérons, Cadillac, Loupiac, and Ste-Croix-du-Mont all crafting predominantly sweet, white, botrytis cinerea wines of excellence. In 1855 and in view of the Universal Exhibition to be held in Paris, Emperor Napoléon III decreed that all of the great châteaux of Bordeaux should henceforth fall under a tiered system of classification that underscored their standing and qualitative relationship to one another. He ordered the region’s wine trade to draw up a list of the most historically prestigious domains of the region, which ultimately yielded the five-tier classification of the great châteaux that we see today. The only other Bordeaux district to be classified at the time was that of Sauternes/Barsac – its sweet white wines universally recognized as uniquely exceptional! At the top of this Sauternes classification lies Château d’Yquem representing the pinnacle expression of these wines as well as the most sought-after of all the district’s bottlings. 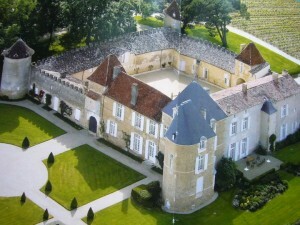 (Click here to see the entire list of châteaux that make up the 1855 classification). Chateau d’Yquem – Paradise found! It is rumored that the flamboyant, Versailles king Louis XIV had a weakness for the wines of Sauternes that he paired with oysters touting the intersection of the two as imbued with distinct aphrodisiacal powers. Some still eagerly embrace this union of vinous and culinary delicacies faithfully emulating the king’s pleasure. Forgive the reach but when it comes to such seemingly odd bedfellows, to each his throne. « Roussillon – How Sweet It Is! l like a king for a day and after you check your bank account like a serf again. Yes. There are so many other classified wines in this great district that deliver so much pure joy with much less monetary pain. Check out the link of these wines at the bottom of the post to discover some of them.